The brown, marmorated stink bug (Halyomorpha halys) is a relatively new part of our insect community here in Western Pennsylvania. This stink bug is a native of northeast Asia (Japan, Korea, and China). Its use of human habitations for its winter hibernation refuges, and its ability to communicate via pheromones and then aggregate in great numbers in some selected house, barn, porch, garage, or any other stink-bug-determined-suitable building makes their presence both in their native and also in their invasive regions impossible to ignore. The adult brown, marmorated stink bug is about three quarters of an inch long. Its brown body is in the shape of a shield and its round head has two antennae. Each antenna has a distinctive (and species specific) light-colored band around it. The stink bug has six legs and two pair of wings all of which arise from its thorax (or middle body segment). The forewings are thick and hardened and serve primarily as protective coverings for the membranous hind wings which are actually used for the insect’s noisy and somewhat erratic flying. It also has scent glands on the underside of its thorax from which it can release its pungent, protective secretions (a mix of trans-2-decenal and trans-2-octanal). It is thought that the brown marmorated stink bug was first released into the United States in Allentown, PA in 1996. It apparently traveled from northeast Asia in a shipping container that was delivered either to the port of Philadelphia or Elizabeth, New Jersey and then trucked to Allentown. Five years later this new, alien, invasive species was recognized and identified by entomologists at Cornell University. By then large populations were being observed throughout eastern Pennsylvania, New Jersey and New York. This insect has now spread to thirty-five states primarily in the eastern United States. It has very large populations in Pennsylvania, Maryland, Virginia, New York, New Jersey, Massachusetts, Delaware, Ohio, and North and South Carolina. It has also spread to California and Oregon allegedly via a car driven by a person traveling from Pennsylvania to California in 2005. In Western Pennsylvania our first massive fall outbreak of this species was in 2010. The ability of these stink bugs to overwinter is remarkable. There is some mortality among the hibernating bugs, but a significant percentage of them make it through to spring and to their opportunity to mate. Colder temperatures, though, reduce this percentage of survival although these invasive stink bugs can survive colder, winter temperatures than our native stink bug species. Several models of climate change and global warming have included increased survival of stink bugs at higher and higher latitudinal locations with, then, significantly larger spring and summer populations of this potentially destructive pest. 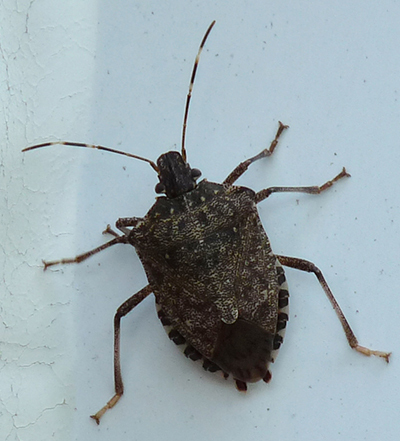 Brown marmorated stink bugs overwinter as adults. They typically gather in a protected place (often a building of some kind) and enter a physiologically inactive, diapause state. They emerge from this hibernation state over a broad range of time (explaining why we see active adult stink bugs throughout the winter and early spring). A mass emergence from diapause occurs as daily temperatures and length of photoperiod increase especially in mid to late May. Adults mate shortly after emerging from their hibernation state and females lay their eggs in clusters of twenty to thirty on the undersides of leaves of many types of host plants (especially apple, crabapple and pear trees in our area). A single female can lay up to three hundred eggs! In four to five days the eggs hatch into the first nymphal stage. These nymphs do not have wings and are much smaller, more brightly colored versions of the adult. The immature stink bugs stay clustered together during their first nymphal stage but then disperse when they enter their second stage. They go through a total of five immature stages over a period of twenty-seven to fifty five days. Here in Pennsylvania the brown, marmorated stink bug can only accomplish one generation per year. There are parts of its native range, though, in which it can go through five generations in a single year! The brown marmorated stink bug has sucking mouth parts equipped with supportive stylets that are strong enough to allow them to pierce plant structures but insufficiently strong to allow them to pierce the skin of an animal (including humans). It is impossible, then, for a stink bug to bite a person or harm them in any way other than exuding some of its foul odors on them. This species feeds on over one hundred different types of plants including several of great economic importance to humans. Fruit trees (especially apple and pear), soybeans, and peanuts are crops significantly damaged by these insects. I have also seen adult stink bugs in my yard feeding avidly on the grapes growing on my grape vine. Predators that feed on these stink bugs seem to be lacking in their invasive ranges. This absence of biological control agents is one of the reasons that this species has so greatly increased in numbers throughout these territories. In their native regions spiders, ants, lacewings, and several species of parasitic flies and wasps feed on these stink bugs. Some predation by birds has also been mentioned. Some interesting observations that Deborah and I have made on our "own" stink bug populations include the leftover exoskeletons of stink bugs eaten by our basement pholcid spiders, aggressive web-spinning spiders wrapping up captured stink bugs in their silk (here's a video of this), and a chickadee repeatedly flying up to one of our stink bug-covered house windows, grabbing one stink bug at a time and taking it off to a feeding roost to eat it. We speculate that our local predators may be becoming inured against the bug’s protective secretions and increasingly aware of the growing stink bug feast around them! Brown marmorated stink bugs communicate with each other in two basic ways: via vibrational “songs,” and via released chemicals that act as pheromones. The vibrations are generated by movements of the stink bugs’ abdomens and are transferred to the plant leaves or other substrates on which the stink bug is sitting. Certain plants (like beans, for example) are preferred by stink bugs because they very efficiently transfer and transmit their vibrational “songs.” These vibrational messages are especially important in the stink bugs’ mating behavior rituals. Stink bugs release aggregational pheromones especially in the early spring and fall. These pheromones stimulate the clustering together of the stink bugs in over-wintering sites and lead to large accumulations of individuals in the most optimally protective sites. The exact chemical involved in this aggregation is thought to be very similar chemically to the methyl 2,3,6-decatrienoate previously identified in the brown winged green bug (Plautia stali). Determination of the precise pheromone chemical could be a useful tool in trapping and controlling populations of this growing pest.